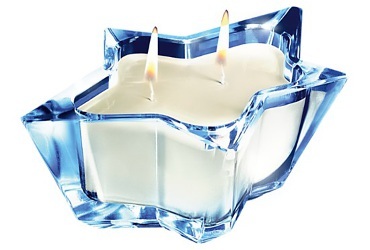 Part two in our eight-part series on fragrance related holiday gifts features home fragrance items, all sorts. Do add any of your own recommendations in the comments! 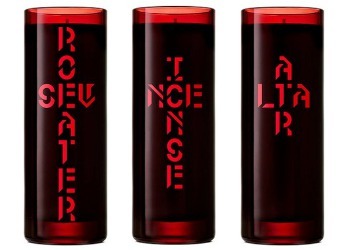 From Byredo, the Saints candle collection ("For Holiday 2016 Byredo presents three new fragrant candles inspired by veladoras, prayer candles or seven-day candles"), with Rosewater (rose and geranium), Incense (incense, eucalyptus, guaiac, labdanum, amber and patchouli) and Altar (clove, carnation, ylang, papyrus and vetiver). 400g, $140 each. From Diptyque, the "Curiosity Carrousel" (which some of you will recognize as a variation on Angel Chimes): "A nod to the founder’s collection of curiosities, this enchanted machine is mechanically elegant and stylistically kitsch. Once the flame of a 70g candle has been lit, the heat generates an air current, causing the birds to dance around the candle creating a theatre of light and shadow. This toy-like creation is undeniably festive." Attaches to any Diptyque 70g candle (or possibly other jar candles as well), $40. From Thierry Mugler, the Etoile des Reves candle: "the perfect finishing touch to her boudoir ritual. Decadent yet calming, its celestial scent will soothe and inspire dreams and fantasies." With bergamot, praline, patchouli and vanilla, $80 at Bloomingdales. 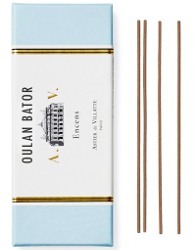 From Astier Villatte, incense in a variety of fragrances. Shown is Oulan Bator ("Wild escape upon a desert steppe. An encampment, a herd of goats. Crude, supple leather steepedin tobacco and wood smoke from the campfires. Ambergris and Angelica Root essence.") 125 sticks for $62 at Luckyscent. 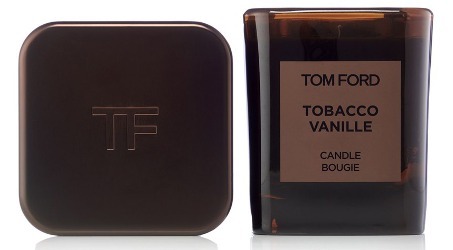 From Tom Ford, the Tobacco Vanille candle: "Tom Ford's affection for London inspired this scent, reminiscent of an English gentlemen's club, redolent with spice. He reinvents a classic fragrance genre by adding creamy tonka bean, vanilla, cocoa, dry fruit accords and sweet wood sap for a modern, opulent and almost heady impression." $250 at Nordstrom. 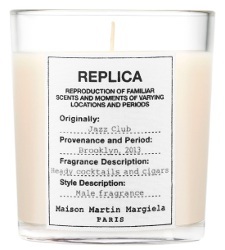 Or, the budget(-ish) alternative: the Maison Martin Margiela Replica Jazz Club candle: "Jazz Club immortalizes the masculine and exhilarating ambiance of a Brooklyn jazz club. The balmy base scent of musk, vanilla, tonka bean, vetiver, and tobacco leaves combine to evoke a familiar but forgotten moment—a night’s sojourn to a hidden jazz club." $60 at Nordstrom. From Archipelago, the limited edition Joy diffuser: "Decorate and fill the room with the joyful blend of orange and crushed cinnamon & spice! 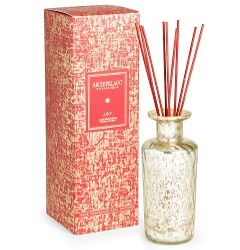 Poured in a elegantly gold fleck glass that comes boxed with red diffuser reeds to match." $45. 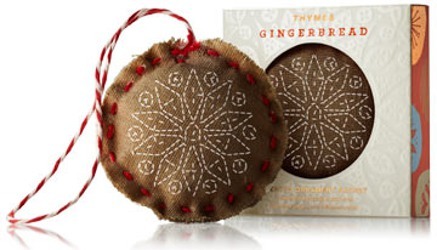 From Thymes, a gingerbread ornament / sachet: "Bring the delectable scent of Gingerbread into any small space. Our decorative fabric ornament adds a nostalgic spicy touch to any festive tree, entryway, car or closet. Hang wherever a touch of fragrant charm is desired." $12. And for any frantic holiday stress and/or family discord, from Aesop, the Composure Aromatique Room Spray: "The first product of its kind in our range for the home, this formulation utilizes a sophisticated blend of botanical extracts including Geranium, Bergamot and Cedar Atlas to provide an ideal fragrance for any space in which atmosphere or spirit require a calming influence." $35 at Barneys. A perfumista stocking stuffer: the Zum Clean Sample pack from Indigo Wild, with one-load samples of their three laundry detergents (Sea Salt, Frankincense & Myrrh and Sweet Orange). $6. 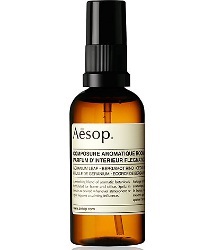 Wow, that Aesop spray looks TRULY useful for these hollidays! If I had a spare $250,that Tom Ford candle would be mine.I looooove the scent,it just doesn’t sit well on my skin(turns sour,like rotten tobacco leaves soaked in vinegar). Try the Jazz Club, it’s worth a shot! It was my favorite of the Replica series. Lol.I’m easy,and I *mostly trust your opinion!???? Ooh! I think that Diptyque carousel thingy might be a possibility. I like kitsch. I’m kind of shocked it’s only $40, even without a candle. I had to read it again. Indeed, it is perfumath free! It is true that it’s only $40. 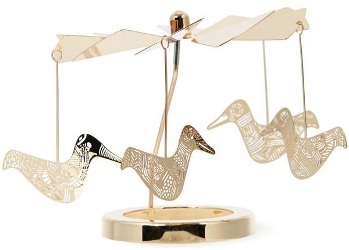 And I want one — I always loved angel chimes and the modern ones are kind of flimsy. But, this one cannot be that big if it fits on one candle, and worried about how much one flame can really make it move? So would like to see it in action. I’m taking that as you suggesting I walk up to the Diptyque boutique! I know! It’s quite lovely. We had angel chimes growing up….wonder where those are. I loved them. We have such a tiny space now, I have to be careful. We’re pulling out decorations this weekend, which means some things need to be relegated to storage. I would love to have our old ones back — the newer ones I’ve bought, the metal is so thin that they fall over all the time. Love that one! We had the angel version growing up. Price is right as well. Oooh, one of each please! My suggestion along these lines is Dr. Silkman’s Body Lotion Candle. I bought my large tin in Dreamsicle at the Bryant Park holiday shoppes. You burn the candle and as it liquefies, you dip your fingers into the melted substance and use it as a hand and/or body lotion! It’s vegan. From Etsy (link below), the large candle is $27 with $3 shipping within the U.S. I think it makes a novel, Eco-friendly, reasonably-priced gift! Thank you, did not even know body lotion candles were a thing! Have to make a trip to Bryant Park. We usually make Union Square our priority because it’s our old neighborhood, and we remember the days when it was smaller. But…I have to re-validate my library card, so maybe that’s a good excuse to visit stores! Cool idea! I’ll make a note to check this out when I go there hopefully very soon.